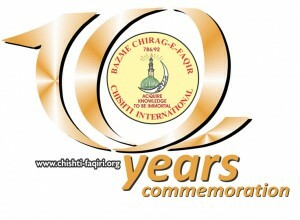 Bazme Chirag-e-Faqir Chishti International (B.C.F.I) is indeed living up to its name by reaching out to the poor and needy, not only in South Africa but in India and other parts of the world as well, by providing the masses with the most basic human needs, viz. food and spiritual enlightenment. The Sufi organization B.C.F.I. was founded by his eminence Hazrat Sayed Mehboob Ali Shah (R.A.) Chishti Nizami Faqiri who hails from Ahmednagar district in Maharashtra, India. The organization is currently directed by his eminence Hazrat Sayed Mohsin Ali Shah in its purpose of serving mankind and guiding mankind towards the Creator, by spiritual purification of the heart and dissemination of Islamic knowledge. The organization embarks on spiritual programs throughout the year throughout South Africa, India and abroad and has members serving in the organization Internationally.